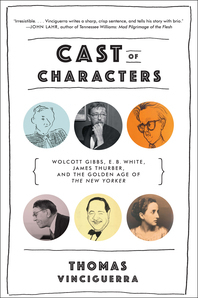 Cast of Characters - Description | W. W. Norton & Company Ltd.
From its birth in 1925 to the early days of the Cold War, The New Yorker slowly but surely took hold as the country’s most prestigious, entertaining, and informative general-interest periodical. In Cast of Characters, Thomas Vinciguerra paints a portrait of the magazine’s cadre of charming, wisecracking, driven, troubled, brilliant writers and editors. He introduces us to Wolcott Gibbs, theater critic, all-around wit, and author of an infamous 1936 parody of Time magazine. We meet the demanding and eccentric founding editor Harold Ross, who would routinely tell his underlings, "I'm firing you because you are not a genius," and who once mailed a pair of his underwear to Walter Winchell, who had accused him of preferring to go bare-bottomed under his slacks. Joining the cast are the mercurial, blind James Thurber, a brilliant cartoonist and wildly inventive fabulist, and the enigmatic E. B. White—an incomparable prose stylist and Ross's favorite son—who married The New Yorker's formidable fiction editor, Katharine Angell. Then there is the dashing St. Clair McKelway, who was married five times and claimed to have no fewer than twelve personalities, but was nonetheless a superb reporter and managing editor alike. 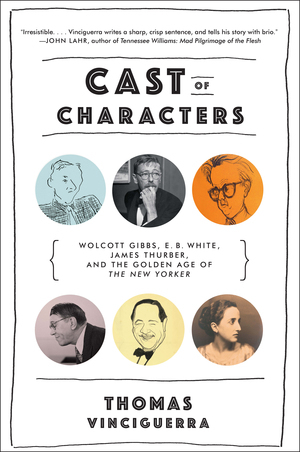 Many of these characters became legends in their own right, but Vinciguerra also shows how, as a group, The New Yorker’s inner circle brought forth a profound transformation in how life was perceived, interpreted, written about, and published in America. Cast of Characters may be the most revealing—and entertaining—book yet about the unique personalities who built what Ross called not a magazine but a "movement."